If you are still among the persons who live with the impression that the pencil skirt is only for drastic and old-fashioned women, you are very wrong. Anyone that fits into the medium or tall height should have such a piece of clothing into their wardrobe. The pencil skirt is for sure one of the most versatile pieces of outfit from any woman’s wardrobe. It helps you to create an interesting look, to highlight your waist and also your curves. This type of skirt is a timeless piece of outfit. And it seems that it will never get old. Important is to find the best ways and the most inspired combos that will help you to highlight the best parts of your body. 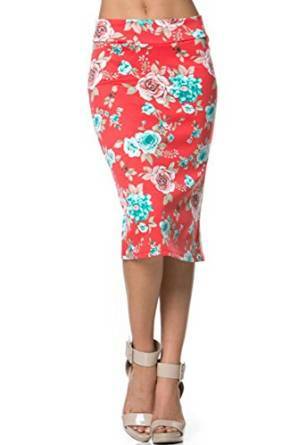 You will discover that the pencil skirt can be of great help and it is very offering too. For a very comfortable look, you should wear this type of skirt with a sweater or a hoodie, plus a pair of sneakers and a chic backpack. In this way you can obtain a very relaxed look. –	With a white simple T-shirt, a denim jacket and a pair of ankle boots. –	With a striped T-shirt and a pair of wedge sandals. For example, if you want to add to your look a chic note, you can wear the pencil skirt with a pair of high heel shoes or even with a pair of wedge sandals as I was saying above. Another idea that can guarantee a very interesting chic casual look is to combine the pencil skirt with a pair of high heel sandals and a funny message T-shirt. It is a chic look but extremely comfortable. A much sportier image but equally chic and very cool is to wear a pencil skirt with a pair of sneakers and a leather jacket. I was saying above that this type of skirt is perfect for many women, not only for the serious and extremely conservative ones. Well yes, but along with that aspect, it is a piece of outfit that can perfectly suit a loose outfit (as in the above examples) not only with the formal outfits as some women might wrongly think. Be bold and add this piece of outfit into your wardrobe, it is a very interesting one for sure. The pencil skirt is a very chic piece of clothing, very versatile and, if you know how to wear and match it with other clothes, it can be the base of many chic and very sensual outfits due to its feminine and retro note.